Nestled between Southeast Asia and Indonesia, The Philippines is an archipelago of 7,107 islands. 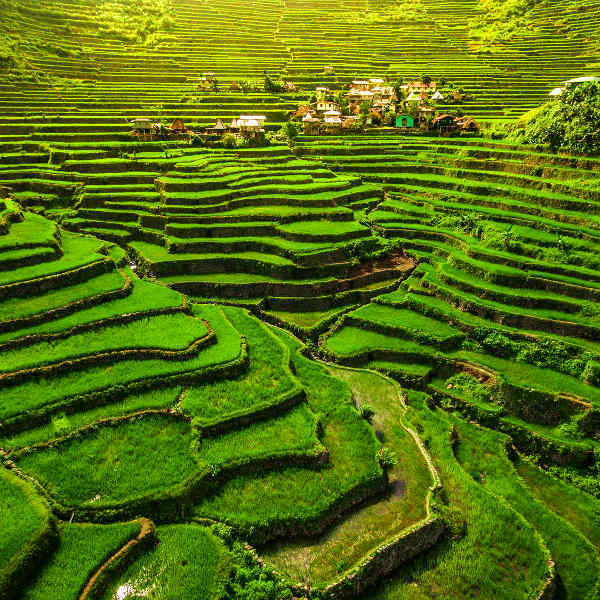 Populated by over 100 million people, The Philippines boasts spectacular landscapes of rainforests, volcanoes, rice terraces and sprawling beaches. Popular tourist attractions include Fort Santiago in Manila, the Banaue Rice Terraces on Luzon and the silky, white beaches of Borocay. 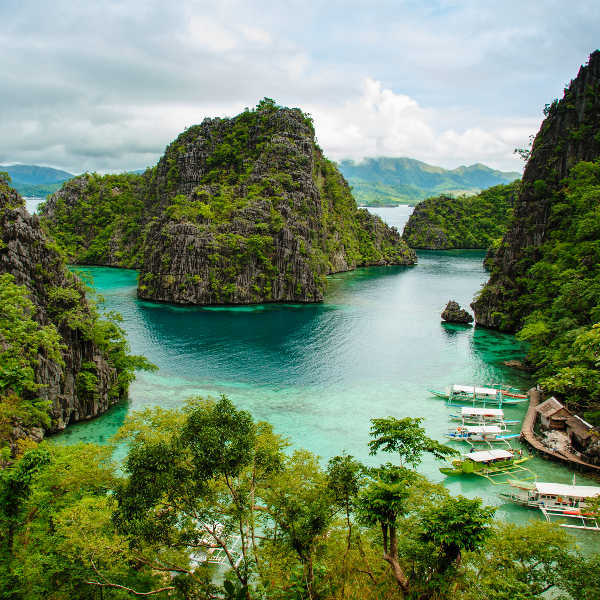 Get ready for a world of discovery because cheap flights to The Philippines are now available! The country’s hub airport is Ninoy Aquino International Airport (MNL), a 30-minute drive from the centre of Manila. Island hopping is a must-do in The Philippines. With 7,107 islands making up the archipelago, get ready to explore the hidden beaches, turquoise lagoons and incredible marine life in the coral reefs. The islands of The Philippines are waiting to be explored! Trek through the rice terraces and rainforests to cascading waterfalls, hot springs and volcanic craters. Canoe along underground rivers and scuba dive in Coron. 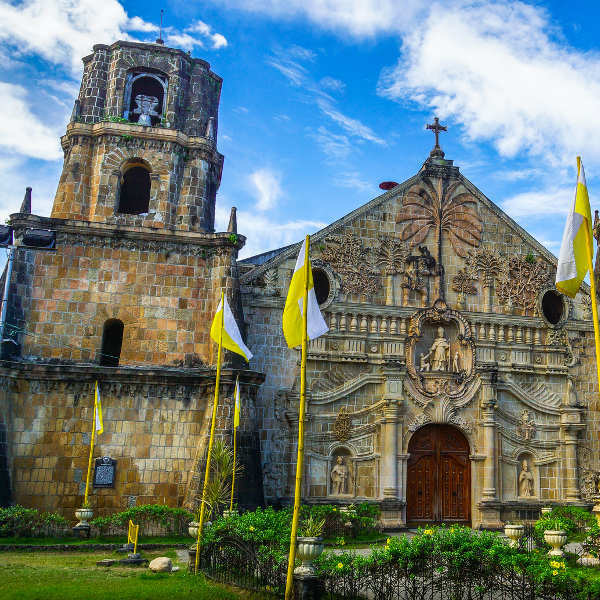 From 17th-century Spanish-built cathedrals in Vigan and Taoist temples in Cebu, to ruins and shipwrecks of WWII, the historical cities and sites on the islands paint intriguing stories of battles lost and won. The Philippines experiences a distinct tropical climate with a wet season (May-October) and dry season (November-April). To experience the best of the islands, beaches and outdoor activities, you definitely want to go during the dry season. Be aware that April and May are the hottest months, so wear plenty of sunscreen as temperatures may peak to around 36°C. The wet season brings typhoons and occasional flooding, resulting in cancelled flights and road closures, especially around July and August. The Visayas islands, Mindanao and Palawan are less affected by the heavy downpours. For the cheapest flights and accommodation, visit The Philippines between June and September. The Philippines is a sparkling jewel waiting to be discovered. With its beguiling beauty and fascinating history, it’s sublime landscapes and down-to-earth people will creep their way into your heart. Manila is the capital city and base from where to explore the other islands. The city is described as chaotic and is home to the old Spanish walled-city of Intramuros, established in the 1570s which gives you a real sense of history and street life. To the south of Manila, the picturesque city of Tagaytay overlooks the glossy Lake Taal cradled within the Taal Volcano. The magical theme parks, beaches and wreck dives await in Subic Bay; while a scenic trip north affords you spectacular mountain landscapes until you reach the awe-inspiring rice terraces of Banaue. Even further afield, history lovers can marvel at the colonial town of Vigan – a UNESCO World Heritage Site. Avid hikers should include a four-day climb up Mayon, with even more craters, thermal springs and waterfalls in the Bulusan Volcano National Park. To experience the best of the country’s pristine beaches and vibrant nightlife, Borocay and Cebu are the ultimate hotspots. If you’re in search of incredible diving, Puerto Galera and Apo Reef are the top choices, though anywhere you dive in The Philippines will showcase the most amazing sea life in all its vivid colours. For a more laidback atmosphere, the seaside town of El Nido on Palawan island is an enchanting little hub of beach bars, seafood barbecues, beach cottages and water sports aplenty. In Puerto Princessa, the Underground River takes you on a mystical journey through enchanting caverns. Bask on the ivory beaches, hand pick souvenirs, meander through historical ruins and get your thrill of adventures in The Philippines. Compare several airlines, and book your cheap flights to The Philippines today! Aside from the sensational hype around the country’s political issues, The Philippines is a very welcoming destination and the locals are incredibly hospitable. Exercise the usual precautions and watch out for pick-pockets and scammers around busy areas and tourist hotspots. If you’re planning any adventurous activities, make sure you have a reliable guide. Diving enthusiasts should preferably dive with a PADI-certified instructor, rather than an unlicensed operator offering cheaper tours. With its no-nonsense war on drugs, do not even consider buying or consuming any illegal substances. You may be part of a set up and will have to face harsh penalties. There are no required vaccinations, unless you are entering The Philippines from a yellow fever country, in which case an international certificate is required. It is advisable to be immunised against typhoid and hepatitis A, as you may be exposed to contaminated food and water. Stick to bottled water only. Although the pharmacies in The Philippines are generally well-stocked, it is a good idea to bring your own basic first-aid kit, especially if you’ll be travelling off the beaten track. Divers should bring treatment for coral cuts and ear infections. Use a strong insect repellent to ward off pesky mosquitoes, especially at night.